Maritime law has an international character. The practising lawyer will be confronted with international conventions and other international instruments containing uniform law. It is broadly acknowledged that such instruments should be construed and applied uniformly. Therefore, knowledge of foreign judgments is imperative. This book contains an extensive comparative law study of English, American and Dutch law concerning the construction of The Hague (Visby) Rules. Australian and Canadian law has been discussed where relevant. The authors have attempted to present law at an academic level in a way which will be useful to the practising lawyer. Lawyers dealing with shipments passing through the major European ports of The Netherlands will especially appreciate the book’s emphasis on Dutch law, which has a broader scope of application than one might expect. Dutch law is often mandatorily applicable when cargo is discharged at a port in The Netherlands, and Dutch Courts are obliged to apply Dutch law to questions of who can claim or sue and who can be sued under a Bill of Lading. Dutch law also applies to ship arrest and the release of vessels against security, the right to conduct a survey (including the question of which documents should be disclosed), and the enforced sale of vessels in The Netherlands. 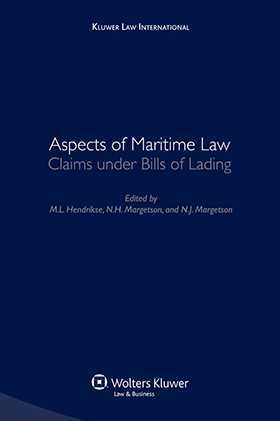 Other matters discussed in this book are global limitation of liability, the applicability of The Hague (Visby) Rules in the Netherlands and electronic bills of lading. This book will be of interest to practitioners working in this very specialized field, as well as to students of comparative law. It will especially be of practical value to anyone dealing with cargo damage, ship arrest or litigation in the Netherlands.